With the help of an army of volunteers, the Papoose Club will serve pancake breakfasts to about 1,600 people this weekend to raise money for local organizations that benefit children. The annual Wagon Days Pancake Breakfast will be held Saturday morning before the Big Hitch Parade and on Sunday morning before the Wagon Days Duck Race festivities. 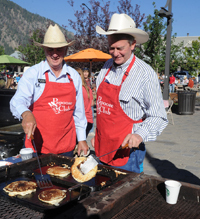 Pancakes, sausage and scrambled eggs will be served both days from 8 a.m. to noon in Ketchum Town Square. The breakfasts are the main fundraising tool for the Papoose Club, which has been helping Blaine County’s children since 1954. Breakfast organizer Rose Burbank said the event raises about $11,000 every year. “It’s a delicious way to start off the weekend, but mostly it’s a way to support a cause that we’ve been doing for so long,” she said. Burbank said the funds raised are available for any group that benefits children and can demonstrate a specific need. Among the 27 recipients that have shared in the breakfast proceeds are The Hunger Coalition, Sun Valley Ballet, Hailey Ice, Wood River High School model U.N. and Senior Bash, Girls on the Run, Boy Scouts and Girl Scouts, and YMCA summer camp. Burbank said an advantage to the Papoose Club money over most other funding sources is that the club can distribute its money immediately for unforeseen expenses. She said the proceeds are also used to provide college scholarships to local students in need. Burbank said the event can take place only through widespread community support. The club is being helped with its food costs this year by Power Engineers, Sun Valley Insurance and Marketron. Power Engineers is also supplying cooking grills. As always, Atkinsons’ Market is ordering the food and providing refrigerator space convenient to the breakfast’s location in downtown Ketchum. Starbucks is providing all the coffee. An army of volunteers, including prominent community figures, will do the cooking and serving. Burbank, who has served as the club’s president and treasurer, said she first heard about the club when she attended a Wagon Days breakfast just after moving to the Wood River Valley. Prices range from $5 – 8. Children 3 and under can eat for free.